Alice Vlcek There’s no word for the school of art that Alice Vlcek commands. It is a mixture of geometry, texture and deeprooted emotion, deriving from action painting or abstract expressionism. “My intention in my work is to make you feel as if you were listening to music, to make you feel that rhythm, energy and movement. My intention is to re-create that experience through my work,” she said. Vlcek studied with Dutch-born abstract expressionist painter Willem de Kooning in her two years at New York Studio School of Drawing, Painting and Sculpture in the early 1970s. He is her greatest inspiration. She is moved by his technique in texture and layering, and his brush strokes especially find their counterpart in her work. She also draws inspiration from other artists, like Joan Mitchell, Kandinsky and Hoffman. Vlcek comes from a long line of artists, and has been sketching and painting since she could hold a pencil. She grew up south of Boston, in a small town called Hanson. She got her BA in liberal arts from Simmons College. After her sophomore year at the school, Alice married John Vlcek and the couple moved into a small apartment in Cambridge. Following a short stay in Houston, Tx., The Vlceks longed to move back to the Northeast, to be near the sea. They moved to New York City in 1968 and came to Brooklyn after a search for affordable housing. They are comfortably settled into Prospect Heights. It was in New York that Vlcek received her formal training, she says. She began her career as a portrait and landscape artist, attending Brooklyn Museum School 1968-69. For the next two years, she studied at New York Studio School of Drawing, Painting and Sculpture under de Kooning, Katz, Vicente, Resnik, Guston and Geist, among others. Finally, she came to Brooklyn College for graduate study in painting, studying under Pearlstein. 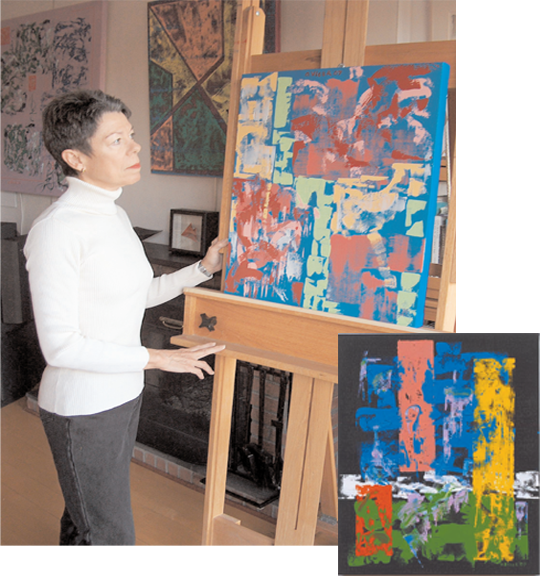 In 1990 Vlcek found herself shifting from portraiture more toward the abstract. “I needed more freedom. We experience the world more through our inner [selves] than our outer [selves],” she explained about her transition. Once she arrived at her particular style, she has never looked back. work. She has had over 14 shows in her career, with at least five of those being solo exhibits. Her most recent show was at the Miwa-Alex Gallery at 24 East 22nd Street in Manhattan. It was her second solo show at this gallery. This article appeared in the Brooklyn Daily Eagle, written December 19th 2007, by Jacquelyn Ryan.